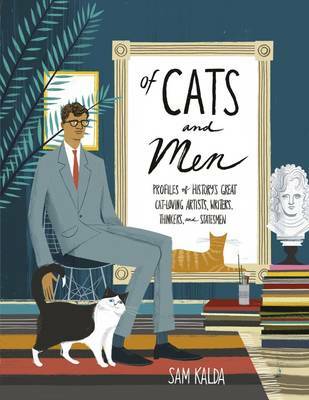 Of Cats and Men is a stylish illustrated gift book from an award-winning artist profiling notable cat-loving men throughout history in words and pictures. Sam Kalda presents a fresh approach to the cat book trend that is smart, sweet and driven by engaging and beautiful illustrations. Appealing to both men and women, Of Cats and Men is stereotype-breaking and charming, making for a highly giftable book. The 30 men profiled range from writers and artists such as Haruki Murakami, T.S. Eliot, Marlon Brando, Andy Warhol, Freddie Mercury and Ai Weiwei, to historical luminaries such as Sir Winston Churchill, Edward Lear and Sir Isaac Newton. In each of the profiles, readers uncover the men's devotion to their feline companions, surprising moments of fame for their beloved cats throughout history, and more. The book also features beautifully hand-lettered quotes, such as Twain's "When a man loves cats, I am his friend and comrade, without further introduction."